lasting-boot a video by tmaiorana on Flickr. Time-lapse of a lasting a prototype boot that I’m working on for my father. The last is one of the most essential tools in shoe making. Unfortunately, it’s also one of the hardest to find. 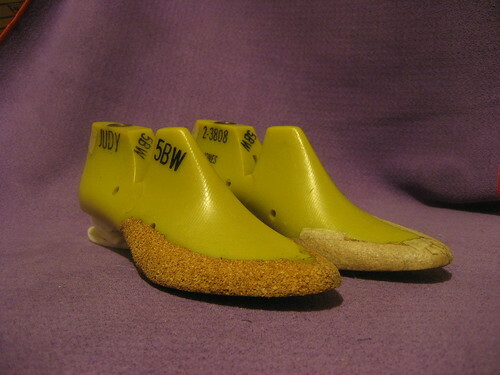 If you don’t have a lot of money or luck or the patience and skill to make your own, getting a pair of lasts in the right size and style is highly unlikely. So let’s change that. I have more lasts than I can possibly use. I hang on to them for both sentimental and practical reasons, so I’m not interested in selling them. However, I don’t want to see them go unused. There are so many budding shoemakers out there who could put them to loving good use. So, inspired by Oakland’s Tool Lending Library, I’m going to start my own little library. This one will lend lasts. I’m still working out the details, but here are the basic rules. Take care of the lasts. Don’t do anything to the last that can’t be undone. You can add cork to it, but you can’t remove any of the original material. If it’d too big, get a smaller size. These are my babies after all. Look after them. I know shoemaking takes time, but I can’t let you hog the lasts. Make sure to return the last within 6 weeks. I’ll give you a due date when you check it out. This is a community. Let others benefit from what you’ve created. Also, I’m curious. If I’m going to lend you my lasts I should at least be able to see what you created with them. Seems fair, right? Pay for your own postage. I’m just prototyping this idea. I’m sure there are plenty of complicating factors which I can’t anticipate at this moment, so expect things to change. For now, email me. TOM [ at ] REDCOVERSTUDIOS [ dot ] COM. I’ll make sure you’re not a robot or sketchy and we’ll go from there. How do I find what lasts you have? Most of my lasts are up on my Flickr site. Currently, I don’t have a sophisticated system for searching, but I have tagged most of the lasts by size and gender. When you find a last you like, not the image title and send that to me. I’m also in the process of cataloging the rest of my lasts, so there’s more to come. Prototyping is such a discipline. I was so tempted to use leather to try this out. Paper has similar stiffness so it did the trick. When in doubt, don’t buy/make anything. There might be something here, but since I’m not that steeped in the fashion world, I’m sure this could have been done before. If anyone knows of something similar, please let me know. 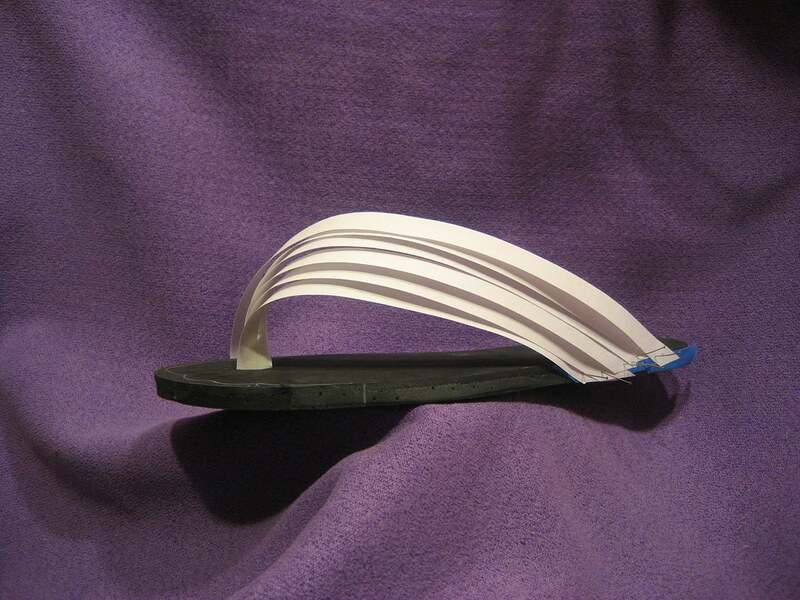 The idea is that the initial strap holds the foot and the rest are there as decoration. I’m pleased with the architectural aspects of it and I think there could be some interesting things that happen with the light on the different layers. The underside of the leather also has tons of possibility. I’m also curious how it will interact with the shape of the foot. This is going to yield some unusual lines. How comfortable will it be? How will it perform in action? Will it be playful? Annoying? The paper was great. Just pinned it to the EVA blank. No glue, no waiting, infinitely modifiable. I need that. I’m not really sure what I’m doing here. Just playing around trying to find something that is worth pursuing in more detail. Trying to come up up with something new is hard.